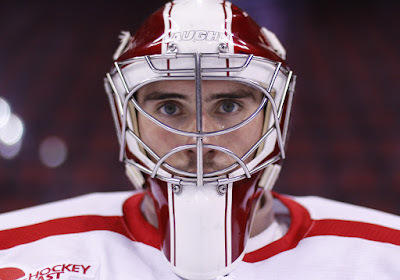 On Wednesday, April 6th of 2016, the Pittsburgh Penguins signed goaltender Sean Maguire of Boston University to a two year, entry level contract. A 4th round pick in the 2012 NHL Entry Draft, Maguire had just came off of his senior year. Through 39 games played for BU (25 started), Maguire went 13-9-1 (yes, this is correct) with a 2.41 goals against average and a .920 save percentage. Since Maguire has signed an ELC, he is ineligible to play college hockey (as he would be next year anyway, being he is coming off of his senior year.) Considering this, the plan for Maguire is likely for him to report to the AHL affiliate of the Pittsburgh Penguins: the Wilkes-Barre/Scranton Penguins. There, it can be assumed that he will serve as backup to the current starter Tristan Jarry, whereas Brian Foster would presumably be sent back down to the Wheeling Nailers. A combo of Jarry and Maguire is likely for next year, as well. Maguire missed his 2014-15 college junior season with a concussion, but has rebounded spectacularly in his senior year. We can only hope Maguire has a healthy and prosperous future ahead of him.